Color: House mice are covered in short hair that is light brown or gray to black in color, with lighter bellies. Body: Their ears and tail also bear hair, although much less than their bodies. Size: Adult mice weigh approximately 12 to 30 grams and can grow up to 20 cm from the nose to the tip of the tail. Feces: Droppings are rod-shaped and pointed on both ends. How Did I Get House Mice? House mice can use even dime-sized cracks to gain entry into homes. They seek shelter indoors to escape inclement weather or predators like snakes and coyotes and to locate food sources. Cluttered attics and basements provide excellent hiding places for the pests to build nests and reproduce, while dirty dishes and unsealed pantry goods offer food sources. Wall voids and voids under cabinets are also likely places for mice to live. How Serious Are House Mice? Because house mice thrive under a wide range of conditions, are secretive and very cautious, they are hard to control. The pests are rarely apt to bite someone, but their presence can be harmful to human health. Their droppings and urine contaminate food and if the population is not controlled house mice can cause contamination problems in places where they nest. Diseases that can be transmitted by house mice include lymphocytic choriomeningitis and food poisoning. 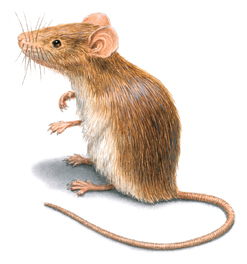 Almost all mice problems require the use of an Integrated Pest Management Program (IPM) approach. Therefore, the first thing your Orkin pest management professional (PMP) will do is correctly identify the mouse pest and develop a treatment plan that is effective and efficient for the particular species causing the problems. Depending on your specific situation, the Orkin PMP may employ both non-chemical and chemical methods. Exclusion – sealing off sites that allow mice to enter a structure. Sanitation & debris – Your PMP will recommend using both inside and outside sanitation measures to help minimize available food and water that attracts and supports a mouse population. Traps – Many times your treatment plan will include using traps and other mechanical devices to kill or remove mice. Baits – Your PMP may also elect to use chemical products, such as rodent baits, that are formulated to kill mice. One final thing you should keep in mind – don’t procrastinate when you see signs of a mouse problem. If you wait too long to start control measures, a few of them can quickly become a large infestation. See Signs of a House Mouse Infestation. The house mouse is a small mammal named for its propensity to live within human habitats. Next to humans, the common house mouse is one of the most prevalent mammalian species in the world. Native to Asia, these rodents have spread throughout the world. They are most commonly seen living within or near human habitations. They may also be used as laboratory subjects and contribute greatly to scientific studies. Normally, the house mouse makes its home in farm fields, grassy and wooded areas, building nests in areas that are dark and protected from the elements and close to a readily available food source. When available, the house mouse prefers seeds and nuts in its diet, but this opportunistic feeder will eat almost anything available. When the temperatures outside begin to drop, house mice, since they don’t hibernate, begin searching for a warmer place to live. Often attracted by the smell of food and the warmth of a structure, the house mouse can use any opening, such as utility lines, pipe openings, and gaps beneath doors, to gain entry into a home. House mice walk, run and stand on all fours. They can stand on the hind legs, as well, and are supported by the tail, which also provides balance while in motion. The house mouse has a sharp sense of hearing and communicates with other house mice through squeaks. Some of these squeaks are audible to humans, while others extend into the ultrasonic range. Where Do House Mice Hide?